The fujara is an awesome overtone flute of four to seven feet in length. Fujara is absolutely unique hand made overtone fipple flute and one cannot find similar anywhere but in Slovakia. 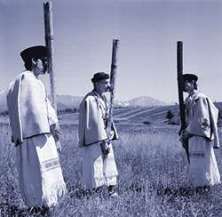 Fujara is a typical Slovak folk instrument whose native home is a small region in central Slovakia called Podpolanie. Fujara flute has 3 holes (vents) but the height of the tone is decided mainly by the strength of in-blown air creating thus various overtones. Fujara flute is designed to play high up into the overtone series as well as in the lowest bass series with a soft haunting voice. That involves shriller tones by playing "scatter" on the beginning of the song (audio samples) and "whoosh" by overblowing the instrument. See our selection of Fujara flutes. awesome dynamic range, natural playing technique, overtone-rich, soft haunting voice. Fujara's beautiful overtones sounding in perfect harmony with the player's breath can give very satisfactory meditative feeling even for the very beginner and make the learning process fun, interesting and thus easy. It means that fujara overtones just won't let you play bad. Fujara's unique breathing-like playing technique will lead you in improvisation and its natural harmonics will just "fit" and make the melody sound good. EVERYBODY can play Fujara nicely! At the same time, every "Fujara" is a unique creative work of art - an original. Traditionally, it's made completely by hand from deciduous trees (elder, maple, locust tree), and it takes up to one month to build a good Fujara from a seasoned piece of wood. Common misspellings in English: fuyara, fuyata, fuhara, fuhata, fugata, fugara.